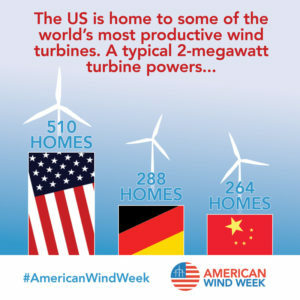 WASHINGTON—America celebrates U.S. leadership in wind energy production and the benefits it creates this week as American Wind Week 2018, August 5-11, officially kicks off. Wind power is an affordable, reliable and rapidly growing segment of the U.S. electricity supply that supports jobs in all 50 states. Those benefits help drive broad popular support for wind power, on display this week at nearly 30 events in over 15 states [including Nebraska], on social media, and through proclamations from governors and mayors from Washington to Kansas and North Carolina. Iowa is a national leader for wind power. Last year, wind farms generated 37 percent of the electricity produced in Iowa, a larger share than any other state. There are 8,000 Iowa wind workers and the state’s wind industry represents over $14.2 billion in private investment. 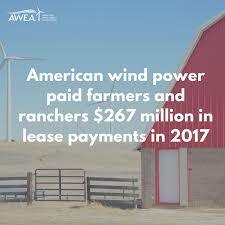 Wind energy is also a new drought-proof cash crop for Iowa farmers, with land lease payments totaling $20-25 million each year. This entry was posted in Nebraska / Midwest News, NewsBlog and tagged American Wind Energy Association (AWEA), American Wind Week, economic benefits of wind energy development to communities, economic benefits of wind energy development to farmers and ranchers, Iowa's wind energy development, Nebraska Energy Office, renewable energy jobs, Senator Chuck Grassley, Tom Kiernan - AWEA CEO, U.S. Wind Champion Award, Wind Energy Generation in Nebraska on August 6, 2018 by Helen Deffenbacher.